Michigan State University’s university-wide Day of Giving, #GIVEGREENDAY, will be held on Tuesday, November 27 in conjunction with Giving Tuesday – a global day of giving. From 12:00 a.m. – 11:59 p.m. EST, Spartan supporters worldwide will be invited through social media and email to participate in #GiveGreenDay by giving their support financially. Join the MSU Alumni of Greater NY on Friday, September 14th from 6:00-9:00 pm at Rooftop Reds in Brooklyn. The evening will include a 3-hour open bar serving wine, beer, and cheese platters. 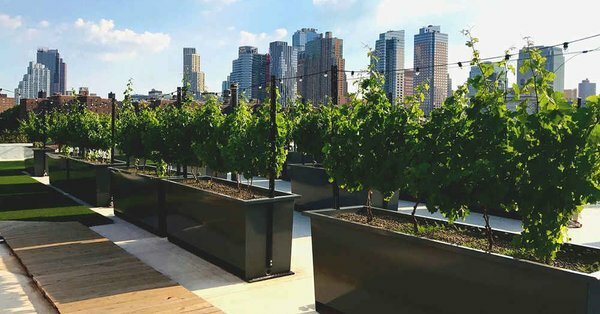 Located in the Brooklyn Navy Yard, Rooftop Reds introduced the world’s first commercially viable urban rooftop vineyard in Brooklyn, New York. “Beneath the pines we gathered” on August 5th, a beautiful Sunday afternoon, in the Ross Pinetum in Central Park for the Annual Spartan Summer Picnic. More than 25 NY area Spartans enjoyed the opportunity to network and socialize while enjoying an over abundance of delicious picnic fare. Last Saturday, April 21, 2018, 12 NYC-Area Spartans came together for MSU Global Day of Service. In collaboration with other Big Apple Big Ten alumni we helped GiGi’s Playhouse Down Syndrome Achievement Center prepare for their annual gala. Volunteers got crafty, helping to make signage and decorations as well as assisted with processing silent auction items. The 21 Spartan alumni, friends, and neighbors who gathered Saturday at the Metropolitan Museum of Art were entertained and informed during an illuminating hour long “highlights” tour. The Temple of Dendur, for example, a gift to the U.S. from the Egyptian government, is housed in a wing built expressly for it. Discounted registration ($85) is open November 9 through November 13.